When you want to kick off your shoes, sip a cool beverage, and watch the mesmerizing currents of the blue Atlantic, the The Towers at North Beach Plantation is the location for your next home. This spectacular seven-and-a-half acre complex gives you an island feel with an oceanfront presence that will promises to deliver upscale living with a touch of international flair. This piece of paradise is located just steps from the ocean where you can hunt shells, build sandcastles, and watch the dolphins frolic just beyond the crest of the waves. Whether you want a romantic stroll on the beach or an intimate evening of conversation and outstanding cuisine The Towers at North Beach Plantation can make your dreams come true and will capture a lifestyle that accommodates the new and relaxed you. You’ll experience that “WOW” factor as soon as you arrive at The Towers complex. Keep in mind that this is just a small sample of what you’ll experience in the North Beach Plantation community. The condos sport from one to five bedrooms for your growing family or visiting guests and are appointed with top-of-the-line furnishings that please the most discriminating homeowner. The nine foot ceilings, hardwood or tile floors, stainless steel appliances, and premium lighting and plumbing fixtures add an ambiance of luxury throughout your property. Granite counter tops and undermounted sinks add an elegant touch to the décor and your state-of-the-art kitchen will allow you to create new dishes that please your family and friends. 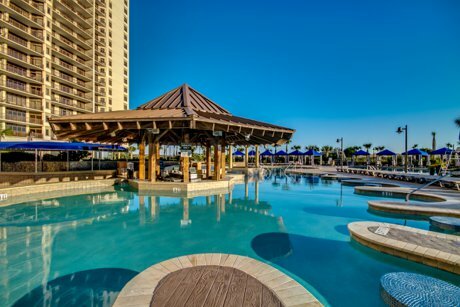 This Caribbean-themed community is the crown jewel of North Beach Plantation which is one of North Myrtle Beach’s most prestigious addresses. The amenities available in this community add value to your investment and will pamper you with an international flavor as you move about the complex. From the serenity of the Cinzia Spa to the 2 ½ acre water feature, you’ll find something for every member of your family to enjoy. You can meander down to Main Street for delicious cuisine ranging from steaks and seafood to sushi and sashimi delectables that you won’t be able to resist. 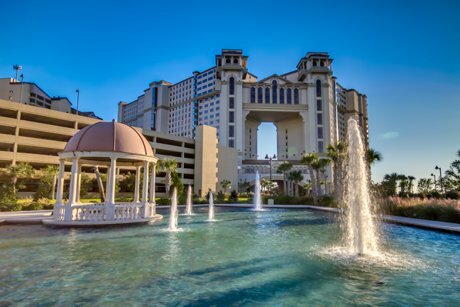 You’ll be near over 100 of the finest golf courses on the East Coast and close to great shopping, dining, and entertainment that is sure to please. You can enjoy mini golf, theme parks, water parks, and sculptures that make your stroll through Brookgreen Gardens a wonderful experience. This premier community is more than just a location; it’s a lifestyle that you often dreamed about when you visited the Grand Strand. This unequaled experience of Coastal living will captivate you, help you to escape, and offer you an exceptional value for your investment. Come home to The Towers at North Beach Plantation and let your new lifestyle begin. Call us at 843-424-6900 for more information on The Towers at North Beach Plantation. And for similar condos be sure to check out Yacht Club Villas at Barefoot Resort and Vista Del Mar at Grande Dunes.